All these cookie recipes have been kid and husband tested. Do you have a favorite Cookie? Share your help us grow our collection. Cookie recipes all time favorites, Christmas & Holiday cookies, to those easy baking recipes treats. Cookies are eaten almost any time of the day for coffee breaks, snacks, desserts, or even as a gift. Homemade cookies are one of the fastest and easiest things to make for a bake sale, baking exchange, school or for your family. We make a batch every week! They go quickly!!! Drop Cookies are dropped by spoonfuls onto the baking sheet. While they bake the dough spreads and flattens. Good examples are Chocolate chip cookies oatmeal popular examples of drop cookies. 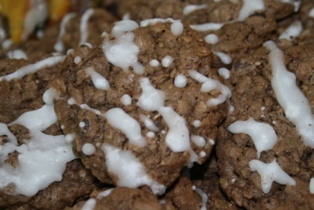 Refrigerator Cookies are made from a stiff dough that is refrigerated to become even stiffer. The dough is typically shaped into shapes like flower, animals and etc. They are generally cut out or maded into cylinders and then sliced into round cookies before baking. Rolled Cookies best example is the Gingerbread men. This dough is made from a stiffer dough then is rolled out and cut into shapes with a cookie cutter. Pressed Cookies made from a soft dough that can be pressed through a cookie press and made with decorative shapes before baking. Bar Cookies are cut into cookie-sized pieces after they have baked. They can consist of recipe of a dough or batter that is pressed or poured into a pan and sometimes can have several layers. Good example of a batter cookie are Brownies. Sandwich Cookies normally uses a filling like icing, marshmallow or jams. The best example is a Oreo Cookie that has vanilla icing sandwiched between two chocolate cookies. Almond Cookie recipe- My Family Loves these Cookies and they are easy to made. Made with almond butter with optional Almond as decor in the middle. Cake Mix Cookie Recipes - Could it get any easier then this? With a few simple ingredients like: cake mix, oil and eggs makes for a yummy treat that is so quick so easy bake. 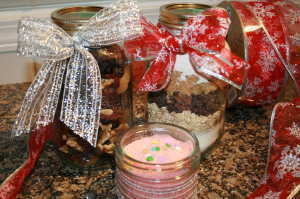 You can add lemon, chocolate chips, dried fruit etc..
Cookie Gifts in a Jar - Homemaded Gifts In a Jar Recipes makes a great present. Remember to firmly pack down all ingredients. Chewy Oatmeal Cookies - Is one of the best old fashion cookies made. It has wholesome goodness of oat a blend of spices and a chewy texture. Definitely makes for one great cookie that everyone loves. 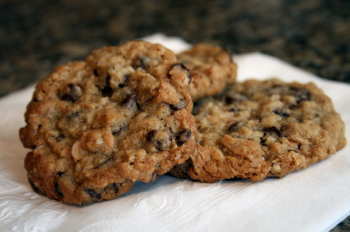 Oatmeal Chocolate Chip Cookies - This is my families & friends absolute favorite. These cookies are chewy and one of the best chocolate chips cookies that are absolutely delicious. Peanut Butter Cookies- You chose from our collection YUMMY peanut butter cookies recipe. Do you like crunchy or smooth peanut butter? Peppermint Oatmeal Chocolate Chip Cookies - These Chocolate Cookies are made with Peppermint Essential Oils. Maded Three batches for a Christmas party. They where gone before the party was half way thru. Russian Tea Cookies "Snowball Cookies" - My kids call these snowball cookies because they are covered with a layer of powder sugar. Snickerdoodles Recipe - Is similar to a sugar cookie but rolled in a sugar and cinnamon mixture. Sometimes known as Snipdoodles or Cinnamon Sugar Cookies they have been around since the 1800's. Snickerdoodles are my Kids & Grandfathers favorite treat! Every Christmas my Aunt make him a batch and he hides them from us kids!!! Sugar Cookie Recipe- Decorate your cookies for the event, season, holidays and make a excellent addition to your Christmas cookies collection. Thumbprint CookiesThumbprint cookies are a shaped cookie and you fill with your choice of a yummy center. You press your thumb into the middle when they are halfway thru baking. Makes a great treat with for the holidays, tea party, or just because. What Other Recipe Lovers Have Said. Cookie Exchanging is a fun way to gather a variety of treats. The key is to keep it simple By following these easy sets. 2.) Have them make their favorite type of cookie. One Dozen for each person participating. Plus one dozen exta to display and sample. 3.) Bring the Recipe printed out to share one for each dozen. 4.) For easy exchanging.Have the exchangers bring Cookies prepackaged by the dozen. For easy exchanging.